The Nobel school has been a strong supporter of the company programme for many years. This programme offers students the opportunity to take ownership of their own fully legal limited liability company. The company is theirs to guide, mould, shape and direct as they see fit. Each team member is a managing director in a key area, such as marketing, sales, finance, to name a few. Our students thrive on this challenge and have shown themselves to be outstanding in past endeavours with innovative ideas, motivated selling and unique marketing. The programme offers students a glimpse of what being a true entrepreneur can be in the real world. This coupled with their rapid development of communication skills through weekly meetings, agenda’s, minutes and a variety of other modern communication techniques creates a truly wonderful learning experience. Outside of the self-esteem building aspect of this experience the pupils also sit an examination that can offer up to 40 UCAS points to supplement their end of year tallies. Overall I am certain you will agree that the benefits offered by this excellent programme can only seek to enhance our student’s abilities when transitioning into their first working environment or allowing them to understand how they could start their own enterprise. The aim of the IT department is to introduce the students to the exciting world of IT. The technology world is ever changing and as a department we look to update our curriculum to match the needs of the students. 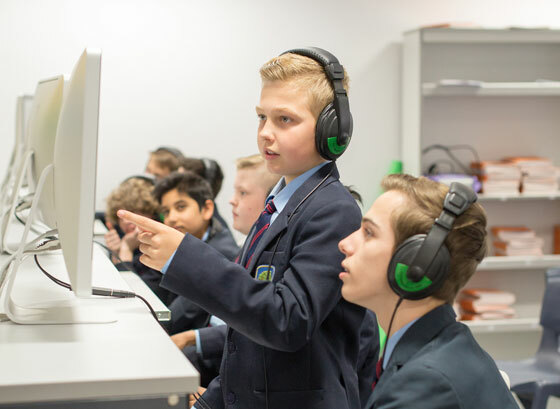 The Key Stage 3 programme is designed to in traduce the students to new topics, such as Programming, Animation, Networking, E-Safety and the use of industry standard software. The curriculum has been recently updated to incorporate the need to deliver Computer science; as a result the department are looking to create links with Primary Schools and Local Businesses to aid the transition from Primary School, through Secondary school and into work. They will learn vital skills to prepare them for the demands of the wider world and prepare them to continue with ICT at KS4, deciding on their own path through IT, whether it be through vocational subjects or GCSE Computer Science. IT at KS4 is an option subject for students and currently the students can study BTEC First in IT and Creative Technology. The students are taught over 3 lessons a fortnight. This course is based on 75% coursework and an exam worth 25% of the final grade. The aim of the course is to introduce the students to the most up to date technologies and get the students to use their creative sides to make Apps, Websites and Animation. There will be further development when the department introduce GSCE Computer Science in September 2014. At KS5, currently the department offer a BTEC National in IT. The students will complete six units of work over the two years. The units will develop the students understanding of how to use ICT in the Business world, with links being developed with local companies.